Hemoperitoneum in pregnancy is rare (especially from ruptured uterine vessels) and potentially life-threatening for both the mother and the fetus. It commonly occurs in the third trimester and in labor. The clinical presentations vary from severe abdominal pain and shock to nonspecific symptoms. Prompt and correct diagnosis, adequate fluid and blood resuscitation, and surgical intervention are essential to prevent maternal and perinatal morbidity and mortality. A 26-year-old primigravida with twin gestation at 34 weeks presented in labor with footling breech presentation, cervical dilatation of 5 cm, and fetal tachycardia. 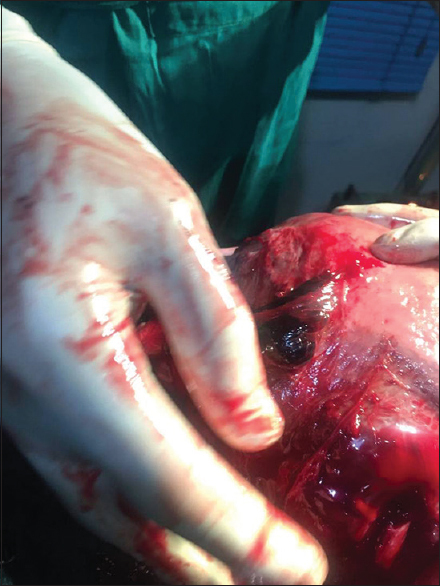 She had an emergent cesarean section, and incidental hemoperitoneum of 1.1 L was encountered as well as bleeding anterior and posterior uterine serosa veins. The neonates were safely delivered, and the bleeding veins were ligated with vicryl suture. The mother and twins were discharged home afterward in stable condition. Keywords: Hemoperitoneum; pregnancy; superficial; twin; uterus; veins. Hemoperitoneum from ruptured uterine vessels in pregnancy is very rare, occurring in 1/10,000 births. It commonly occurs in the third trimester and peripartum period. It can present with the classical symptoms of acute abdomen and hypovolemic shock , or with no specific symptoms at all. A case of hemoperitoneum from ruptured uterine veins during labor is presented with the goal of creating awareness among obstetricians about this uncommon condition as there is a need for a high index of suspicion in parturients with sudden hypotension and/or fetal distress without vaginal bleeding to prevent maternal and perinatal morbidity and mortality. A 26-year-old primigravida with twin gestation who was referred on account of onset of labor at 34-week gestation presented with footling breech presentation of the leading twin. There was no bleeding per vaginam or drainage of liquor. Her antenatal history was said to have been uneventful. She had regular visits to the antenatal clinic and was compliant with her routine antenatal drugs. On examination, she had labor pains intermittently. She was not pale, her pulse rate was 98 beats/minute, and her blood pressure was 100/70 mmHg. Abdominal examination revealed a large for date uterus with multiple fetal parts palpated. Strong uterine contractions were also palpated. There was no generalized abdominal tenderness. The fetal heart rate of the leading twin was 170 beats/minute. Vaginal examination revealed a cervix that was fully effaced, and the cervical os was 5 cm dilated, bulging fetal membranes with footling breech presentation. An assessment of footling breech presentation and a suspected fetal distress of the leading twin was made. Emergent cesarean section was planned, and consent was obtained from the patient. Two pints of blood were grouped and cross-matched. Her hemoglobin was 11 g/dL. The cesarean section was performed using a Pfannenstiel incision. An incidental hemoperitoneum was encountered as well as a slowly leaking ruptured anterior uterine serosal vein [Figure 1]. A low transverse uterine incision was quickly made on the uterus, and the female twins were delivered in quick succession followed by the placenta delivery. The uterus was closed in two layers with vicryl sutures. Another serosal venous rupture was noted on the posterior wall of the uterus [Figure 2]. Both bleeders were arrested using vicryl no. 0 suture. Hemostasis was well secured. There was hemoperitoneum of 1.1 L. Estimated blood loss from surgery was 500 mL. The female twins weighed 2.4 and 2.2 kg. They had fair Apgar scores and were admitted into the neonatal care unit for further resuscitation and monitoring. The patient was transfused with two pints of whole blood. She had an uneventful postoperative period. Her posttransfusion hemoglobin was 9.4 g/dL. She was counseled to register at a tertiary health care center in her subsequent pregnancies and was discharged home on the 5th postoperative day. Hemoperitoneum in pregnancy can be antepartum, intrapartum, or postpartum., Even though it is rare, it can be life-threatening. The etiology of hemoperitoneum can be a ruptured uterus, ruptured broad ligament vessels, or ruptured uterine serosa veins. Hemoperitoneum resulting from a ruptured uterine serosa vein is also very rare. The earliest report of maternal mortality from it was put at 49%. However, a more recent report puts it at 3.6%. This significant reduction has been attributed to the improvement in resuscitative, anesthetic, and operative techniques. Unfortunately, perinatal mortality remains high at 31%. Spontaneous uterine venous rupture is said to be associated with an increased venous pressure even though the specific etiology is unknown. The increased venous pressure is said to be caused by muscular activity during defecation, coughing, coitus, or labor. This eventually leads to spontaneous rupture of the veins. This rupture commonly occurs in the broad ligament (78.3%), at the posterior surface of the uterus (18.3%), and at the anterior surface (3.3%). Typically, pregnant patients with hemoperitoneum present with acute abdomen and hypovolemic shock , although some may also present with nonspecific symptoms, just as in the case presented. She only presented with intermittent abdominal pain of labor without hemodynamic instability. Diagnosing hemoperitoneum early is essential to prevent mortality as late diagnosis has been associated with poor prognosis for both the mother and the infant. Diagnosis of hemoperitoneum before surgery is made in 37% of cases. This rate reduces to 4% of cases following rupture of uterine vessels. Early diagnosis may be very difficult when the rupture occurs during labor because the presence of uterine contraction may mask the pain associated with hemoperitoneum  as it was in the case presented. The management of a classical presentation of hemoperitoneum in pregnancy with shock involves maintenance of adequate circulating intravascular volume by aggressive fluid and blood replacement and a rapid surgical intervention. Even though pregnancy can be safely continued and vaginal delivery undertaken at term in some cases that are diagnosed preoperatively and at an earlier gestation,, often immediate cesarean section is required to identify and deal with the bleeding. Typically, intraoperatively, hemostasis is secured after a cesarean section to prevent fetal compromise and have adequate room for manipulation of the uterus to locate all the bleeding points., However, when bleeding occurs in vessels around the adnexa and on the anterior surface of the uterus, it might be necessary to secure hemostasis first. Commonly, the use of suture material for ligation of the bleeding vessels is employed. The use of clips  and embolization  has also been described. 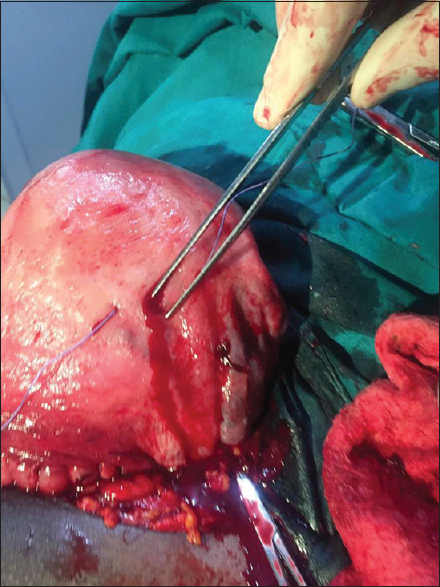 The patient presented had an emergent cesarean section solely because of the footling breech presentation of the leading twin in active labor with imminent membranes rupture and suspected distress of the leading twin. There was confusion as to what might have caused the fetal tachycardia that was found. Hemoperitoneum was an incidental finding as she did not have the typical symptoms and signs. If she had not presented early and because of the ongoing bleeding, her hemodynamic status would have been compromised, and the clinical picture would have been more typical of shock. The experience from this case and literature underscore the importance for pregnant women to receive antenatal care in hospitals with facilities for emergency surgeries and blood products, especially in a country like Nigeria where many pregnant women visit the traditional birth attendants for deliveries. This is the first reported case of incidental discovery of bleeding uterine serosa veins during a cesarean section in a Nigerian woman in labor. The author certifies that consent to write up this case as well as the inclusion of photographs was obtained from the patient. The author certifies that he has obtained all appropriate patient consent forms. In the form, the patient has given her consent for her images and other clinical information to be reported in the journal. The patient understands that name and initials will not be published and due efforts will be made to conceal identity, but anonymity cannot be guaranteed. Díaz-Murillo R, Tobías-González P, López-Magallón S, Magdaleno-Dans F, Bartha JL. Spontaneous hemoperitoneum due to rupture of uterine varicose veins during labor successfully treated by percutaneous embolization. Case Rep Obstet Gynecol 2014;2014:580384. Ginsburg KA, Valdes C, Schnider G. Spontaneous utero-ovarian vessel rupture during pregnancy: Three case reports and a review of the literature. Obstet Gynecol 1987;69:474-6. Doger E, Cakiroglu Y, Yildirim Kopuk S, Akar B, Caliskan E, Yucesoy G, et al. Spontaneous rupture of uterine vein in twin pregnancy. Case Rep Obstet Gynecol 2013;2013:596707. Al Qahtani NH. Spontaneous intraperitoneal haemorrhage during pregnancy. BMJ Case Rep 2012;2012. pii: bcr2012007113. O'Connell MP, Prendiville W. Spontaneous uterine artery rupture: A rare cause of abdominal pain in pregnancy. J Obstet Gynaecol 2005;25:511-2. Ziereisen V, Bellens B, Gérard C, Baeyens L. Spontaneous rupture of utero-ovarian vessels in postpartal period: A case report and review of the literature. J Gynecol Obstet Biol Reprod (Paris) 2003;32:51-4. Wu CY, Hwang JL, Lin YH, Hsieh BC, Seow KM, Huang LW, et al. Spontaneous hemoperitoneum in pregnancy from a ruptured superficial uterine vessel. Taiwan J Obstet Gynecol 2007;46:77-80. Abdalla N, Reinholz-Jaskolska M, Bachanek M, Cendrowski K, Stanczak R, Sawicki W, et al. Hemoperitoneum in a patient with spontaneous rupture of the posterior wall of an unscarred uterus in the second trimester of pregnancy. BMC Res Notes 2015;8:603. Giulini S, Zanin R, Volpe A. Hemoperitoneum in pregnancy from a ruptured varix of broad ligament. Arch Gynecol Obstet 2010;282:459-61. Vellekoop J, de Leeuw JP, Neijenhuis PA. Spontaneous rupture of a utero-ovarian vein during pregnancy. Am J Obstet Gynecol 2001;184:241-2. Jang JH, Kyeong KS, Lee S, Hong SH, Ji I, Jeong EH, et al. A case of spontaneous hemoperitoneum by uterine vessel rupture in pregnancy. Obstet Gynecol Sci 2016;59:530-4. Hemoperitoneum; pregnancy; superficial; twin; uterus; veins.